Introibo Ad Altare Dei: Is Mary Our Co-Redemptrix? The spurious "Benedictine brothers" of the "Most Holy Family Monastery," Fred and Bobby Dimond, are damning more people to Hell. If anyone should disagree with their ever changing opinions on any given subject, they don't hesitate to claim that person is on the road to perdition. The Dimonds suffer from a condition endemic among those who deny Baptism of Desire (BOD) and Baptism of Blood (BOB), namely, the refusal to submit to the authority of the Magisterium. According to them, only infallible decrees are to be believed, and then only their twisted interpretation of them. The approved pre-Vatican II theologians are to be spurned, as are any decrees of Roman Congregations (and even of the popes themselves), if they don't agree with their novel interpretation of some infallible decree. The latest case in point, is an article on the Most Holy Family Monastery (MHFM) website that declares anyone who gives Our Blessed Mother the title Co-Redemptrix is a heretic. The title Co-Redemptrix has pre-Vatican II theologians divided. Some approve and advocate for the title, and others feel it should be a title denied to her as it is unbecoming Our Lady. Neither side declares the title to be a matter of heresy or worthy of some censure short of heresy. As the Dimonds set themselves up as the ultimate arbiters of truth, my post will (a) explain why they are wrong and (b) give the arguments of the pre-Vatican II theologians (pro and con) as to the title Co-Redemptrix. The Church has never decided the matter and, unlike Fred and Bob, I realize I have no authority to settle the issue. Traditionalists are free to adopt either position on giving Our Blessed Mother the title Co-Redemptrix. Pope Pius IV, Council of Trent, Sess. 25, On Invocation, Veneration and Relics of Saints, and on Sacred Images, ex cathedra: “…the saints, who reign with Christ, offer up their prayers to God for me; and that it is good and useful to invoke them suppliantly and, in order to obtain favors from God through His Son JESUS CHRIST OUR LORD, WHO ALONE IS OUR REDEEMER and Savior….But if anyone should teach or maintain anything contrary to these decrees, let him be anathema.” (Denz. 984-987) (Emphasis in original). What the Diamonds, in their duplicity, choose to omit are the following words between the ellipsis, "and that they think impiously who deny that the saints who enjoy eternal happiness in heaven are to be invoked, or who assert that they do not pray for men, or that our invocation of them to pray for each of us individually is idolatry, or that it is opposed to the word of God and inconsistent with the honor of the one mediator of God and men, Jesus Christ...(Emphasis mine). It's clear that Trent was condemning the Protestants who think that because there is ONE MEDIATOR (not two or more--See 1 Timothy 2: 5-6), that saints are not to be invoked and cannot pray and intercede for us without derogating from the one Mediator, Jesus Christ. The Dimonds have no problem calling Our Lady Mediatrix, with no fear of minimizing Our Lord's unique role as the one Mediator. 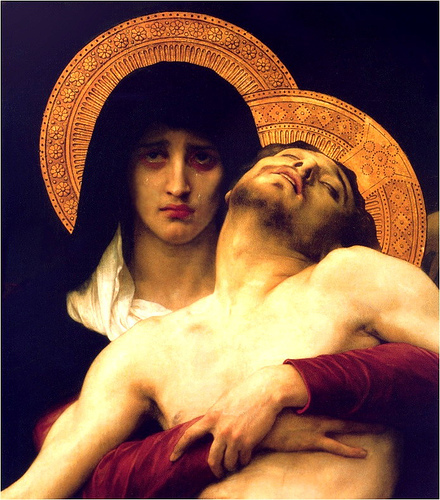 Likewise, Trent was not defining Christ to be the only Savior so as to exclude the possibility of Our Lady having a secondary and subordinate role in redemption. Just as Mary has a role in dispensing all grace (subordinate to and united with Her Divine Son) so as to merit the title Mediatrix without dishonoring or denying Her Son as the one and only Mediator, the title Co-Redemptrix would be given in the same manner. So much for their contorting the meaning of Trent, just as they do in regards to its decrees on Baptism and the sacraments. What about the theologians and popes who spoke of Mary as having a role with Her Divine Son in the redemption of humanity? According to MHFM, "There are a few non-infallible quotations that people bring forward to attempt to show that Mary is Co-Redemptrix. The answer is that they are not infallible and they are simply wrong. They cannot be defended." Well, that settles it! They were not infallible, and we only need to believe those statements that are infallibly defined (or so the Feeneyites contend). These theologians and popes were unaware that the Council of Trent infallibly defined that Christ alone redeemed us to the exclusion of any cooperative role of Our Blessed Mother. Wouldn't that make them notorious heretics who would thereby lose their ecclesiastical office (in the case of a pope)? What good is having a Teaching Authority which is unable to preserve Her members from the errors of errant theologians? Don't expect logical answers anytime soon from our wannabe "Benedictines." As I wrote above, the Church has not settled the question as to whether or not Mary is to be invoked under the title Co-Redemptrix. I will therefore put forward the teachings of two eminent pre-Vatican II theologians; Joseph Pohle who opposes the title, and Juniper Carol, who defends the title. (a) It obscures the fact that Mary herself was redeemed through the merits of Jesus Christ which theologians technically call pre-redemption as She was preserved free from Original Sin "in view of the merits of Jesus Christ" (See Apostolic Constitution Ineffabilis Deus of Pope Pius IX defining the dogma of the Immaculate Conception on December 8, 1854). (b) The title never belonged to the Blessed Virgin before the 16th century and is the invention of recent theologians. (c) Mary might be though of as acting in a priestly capacity. Any/all such titles attributed to Mary, such as "priestess," were solemnly condemned by the Supreme Sacred Congregation of the Holy Office in 1916, and again in 1927. (d) The title Mediatrix most appropriately and comprehensively describes Our Lady's part in the Redemption, which title is sanctioned by primitive Christian usage and embodies all that can be said on the subject. (a) Redemption designates the sum total of meritorious and satisfactory acts performed by Christ while on Earth, offered to the Eternal Father in and through the Sacrifice of the Cross, in virtue of which the Eternal Father was moved (humanly speaking) to reinstate the human race into His former friendship. When we say Mary is Co-Redemptrix of humanity, we mean that together with Christ (although subordinately to Him and and in virtue of His power) She atoned or satisfied for our sins, merited every grace necessary for salvation, and offered Her Divine Son on Calvary to appease the wrath of God, and that as a result of this, God was pleased to cancel our debt and receive us into His former friendship. This co-redemptive role of Mary actually began when She accepted to become the Mother of God by her own free will. (b) Pope Benedict XV, in his Apostolic Letter Inter Sodalicia (March 22, 1918), wrote, "To such extent did she (Mary) suffer and almost die with her suffering and dying Son, and to such extent did she surrender her maternal rights over her Son for man's salvation, and immolated Him, insofar as she could, in order to appease the justice of God, that we may rightly say that she redeemed the human race together with Christ." (c) Pope Pius XI called Our Lady Co-Redemptrix at least six (6) times. In the radio broadcast to the world at the solemn closing of the Jubilee Year which commemorated the Redemption of humanity (April 29, 1935) he prayed, "O Mother of piety and mercy who, when Thy most beloved Son was accomplishing the Redemption of the human race on the altar of the cross, didst stand there both suffering with Him and as a Co-Redemptrix; preserve us we beseech thee, and increase day by day, the precious fruit of His Redemption and of thy compassion." (d) Pope Pius XII, in his encyclical Ad Coeli Reginam (October 11, 1954) distinguishes Mary's role in the Redemption from her role as Mediatrix of All Grace. (e) On November 26, 1951, the entire Cuban hierarchy petitioned Pope Pius XII for a dogmatic definition of Mary as Co-Redemptrix. An entire nation of bishops felt that it could and should be defined. (f) Just as Adam alone brought sin in the world, yet had the cooperation of Eve, Mary is the Second Eve. Christ alone brought redemption to the world with the cooperation of Mary. (g) When the Church teaches Christ alone is our Redeemer, they are referring to the primary, universal, and self-sufficient causality of Christ in the redemptive process which does not exclude Mary's secondary and totally subordinate cooperation which drew all its efficacy from the superabundant merits of her Divine Son. (h) Mary was redeemed by Christ, so how could she both receive the effect of redemption and be the cause of it? Because Mary cooperated to redeem all others not herself. Mary was redeemed by God preemptively in the Immaculate Conception, then together with Her Divine Son, she cooperated to redeem all others. (i) Christ's merits have infinite value, so how can Mary's cooperation add anything to the Passion? Mary did not add (and could not add) anything to Christ's merits. However, God was pleased to accept her satisfaction together with Christ as a fitting way of making her the Second Eve, even as Christ was the Second Adam. When the Church has not settled a question and leaves it open to discussion among the theologians, Traditionalists are free to accept any answer the theologians offer as long as it is not censured by the Magisterium. Such is the case on whether the title Co-Redemptrix properly belongs to Mary. Notice however, how the strongest (and most numerous) arguments come down on the side favoring Mary as Co-Redemptrix. Theologian Pohle's objections are more about the fear of misunderstandings that could derogate from Christ's unique salvific role, not a condemnation of the correct understanding of Mary's role in redemption. Personally, I believe Mary is our Co-Redemptrix. However, that's all it is--one layman's opinion based on the teachings of the popes and theologians. I will not arrogate unto myself alleged Magisterial authority and issue false condemnations of people who disagree. I will leave all that up to Fred and Bobby Dimond, the self-anointed "Benedictine brothers" at Most Holy Family Monastery. I will not doubt if, in the near future, Bob and Fred affirm that Pius XII is in Hell, since they criticized this great pope in one of his videos. Wouldn't surprise me either! Richard Ibranyi (who used to be with them and started his own cult in New Mexico) has condemned all popes to Hell going back to the 12th century!! How absurd! These men are crazy! Is Richard Ibranyi the one who opposes and condemns Scholasticism? Also, I would not call Pope Pius XII a "great" Pope, though. I think he is just an average, moderate Pope. But this is just my own opinion, and I do not mean he is a bad Pope. Personally I think Pius XII was a good Pope until early 1951 when he "changed" Holy Saturday.1951-1958 was a disaster for Pius XII. Richard and the Dimonds have usurped authority & declared themselves the Magisterium. The Home Alone position is saying the Lord Jesus Christ lied and his Church,Holy Mass,and Sacraments are useless.Its basically equating the Gates of Hell have prevailed. I find the opinions traditional Catholics have about Pope Pius XII to be interesting. Some think he was a saint and others think he was a liberal who paved the way for Vatican II. I don't really know a lot about him, but there is one thing I learned about him that bothers me; his belief that the universe was billions of years old. The age of the universe was never defined. Genesis does not say God created the world in six DAYS (mistranslated)but in six YOM--a Hebrew word meaning a period of time. As this is not a matter of faith you can believe as you choose about the age of the universe. It is not just the word "day", but the whole story of creation. I have tried to reconcile it with the story of the modern scientists and I have found it irreconcilable because the differences are too great, even if you take the "days" to mean long periods of time. And I do not know if the age of the universe was ever defined by the Pope infallibly, but is is in the traditional Roman Martyrology and it is read at Midnight Mass. It says Christ was born five thousand one hundred and ninety nine years after the creation of the world. That is what I believe. Of course in the Novus Ordo they changed this because they no longer believe it. Since there is no definition you can certainly hold that opinion and be a good Traditionalist Catholic. Well we all have our opinions, but I put them in the same boat with those who deny that the flood really happened or that the Angel of death really did come down and kill the first born of the Egyptians or that Moses really parted the Red Sea, or that Mana really fell down from heaven in the desert, or that Christ really multiplied the loaves and really cured people and raised people from the dead. All of those things that are taught in the Bible but may not have been officially declared as dogma by a Pope and I consider those who deny these things to be modernists. You rightly consider them Modernists. The Pontifical Biblical Commission condemned the ideas you listed. However, belief in a universe that is old has not been censured. Nor has belief in a young universe been defined. Therefore, it is a subject, like the title Co-Redemptrix, upon which their can be legitimate conflicting opinions among Traditionalist Catholics---and holding either view does not make one a heretic. I find this topic interesting, but it is not really relevant to this blog post. I will just ask you one more question if you will allow me. Let us say that the word translated as "day" really means a really long period of time in Genesis and that the universe really is billions of years old. Genesis says that on the first "day" God created the earth but there was no sun, no moon, and no stars. It was not until the fourth "day" that the sun and the moon and the stars were created. So according to Genesis, if "day" means a long period of time, then the earth was created in the beginning and the sun and the moon and the stars were created billions of years later. Would you then condemn the belief that the stars and the sun were created billions of years before the earth as the big bang theorists believe as contrary to scripture? Thanks. I always respond to my readers questions! Whenever we are confronted with an issue concerning the Faith, the first question we must answer is, "What does the Church teach about this matter?" "Whether in the designation and distinction of six days with which the account of the first chapter of Genesis deals, the word DAY can be assumed either in its proper sense of a natural day, or in the improper sense of a certain space of time; and whether with regard to such a question there can be free disagreement among the exegetes?" This also comports with the Commission's decision of June 23, 1905 (also approved by Pope St. Pius X) that Scripture gives historical accounts except "...where without opposing the sense of the Church and preserving its judgement, it is proved with strong arguments that the sacred writer did not wish to put down true history, and history properly so-called, but to set forth, under the appearance and form of history a parable, an allegory, or some meaning removed from the properly literal or historical significance of the words." In my opinion (and consistent with the decrees of the Pontifical Biblical Commission approved by Pope St. Pius X), Moses meant to convey that man was God's special creation, so the Earth (our planet) takes place of pride over the other celestial bodies. The creation of Man comes last to show Him as God's crowning achievement. There ARE strong arguments from modern science which would validate this interpretation. I stand, as ever, to be corrected should Holy Mother Church be restored and teach otherwise. Personally I don't believe she is but I will not condemn someone who thinks she is our Co-Redemptrix. Introibo - Why are "Traditionalists" so quick to declare and judge other "Traditionalists" heretics? Where is the unity? It seems to me they purport to have some kind of "special" knowledge that nobody possesses but them. All we have to do is obey the Magisterium and practice the true faith before ALL of the changes in the early 50's. We don't have a Pope so anyone calling another "heretic" is just opinion. Here we go with more contradictions. You are stating to obey before the changes in the early "50's", I was told to obey the changes prior to "64" and then told "'68". Traditionalists can't agree on much of anything. So which year is it, and according to what and which "authority"? When there is no pope this is what happens. I agree with the comment above EXCEPT you can call someone's heretic who denies Catholic dogma/doctrine. If someone denies the Assumption or Baptism of Desire, we can and should call them heretics. Where the Church has not spoken, we have no right to condemn or call people heretics. Introibo - Encountered computer problems so this post may be a duplicate. As to the stated "date changes" above, what is your response? As a Traditionalist, we accept Pope Pius XII as the last pope before the Great Apostasy. His changes in the 1950s can be rejected on the grounds that the law ceased to bind due to the fact they became "noxious"---had an evil effect that could not be seen by the pope at the time he promulgated them. Note there is nothing evil with the changes in themselves because the Church cannot give that which is evil, and it would mean Pope Pius XII was an antipope. That being said, Traditionalists are free to use the pre-1951 changes, or the changes up to 1958. The changes of Roncalli (1962), are tolerable as they are not heretical. Anything after 1962, is not acceptable. It emanated as a result of V2 and its heresies. People may have preferences. I attend both 1958, and pre-1955 (SSPV). That's all it is a preference, and no one should condemn anyone else, unless it comes after 1962. Introibo - Thanks for the explanation. Being new, I at times get overwhelmed with trying to navigate the Vatican II mess. There are times I don't understand how I have made it to where I am today. It has to be God's Grace, because I am so unknowlegable in so many areas. It's not easy keeping the Faith in these times, Joann. You're in good company feeling overwhelmed at times--it still happens to me too. We must thank God for the gift of the One True Faith he has given us and never give up. All Roman Catholics practicing the faith (we disregard home alone types) should reject everything after Dec.1950. I know people will disagree and we're not the Pope or Magisterium,we are aware of that trust me. He has a St.Lawrence Press Ordo and says its very good. The one problem he has is they go too far back circa 1939.By saying 1939,they deny Dogma of the Assumption.He also uses the 1945 Psalter. He is thee first priest I've ever met to encourage me to fast after midnight for Holy Communion. His idea is Roman Catholic chapels should be on the same calendar and practice the faith uniformly.Recently he pretty much stated what Joann said in her comment above.The Crisis outside the church is like a Hurricane & everyone is confused.If the true Church could be uniform & stable,more people would see the patience joy & love of True Catholics and would be drawn to the faith. I would love to see things become more uniform! That's a good idea! Introibo, do you think you could do a post on the new translation of the psalter under Pius 12? I am very interested in the liturgy including the Breviary, but have never known much about the history of that change and would like to learn more about it. What was the purpose of the new translation? Did it achieve that purpose? Was the change connected in any way to the other liturgical changes of the 50's and 60's? Which translation should we use? I look forward to your scholarly analysis, my friend. I'll put it on my "To Do List"! Thanks. Introibo- I'm probably asking questions most people on here know the answers to. My question is are we bound to believe in Church approved apparitions? Also, regarding canonizations, I have read where they are not infallible and read where they are infallible. Can you tell me what the Church says regarding apparitions and canonizations? Thanks! For apparitions, see my post of 10/3/16 "You Shouldn't Always Believe What You See." Canonizations ARE infallible. See my post "Praying To The Damned" of 3/8/14. There are currently no bishops with ordinary jurisdiction. I attend SSPV and would consider Bishops Clarence Kelly and Joseph Santay the two that I turn to for episcopal functions. What authority does Clarence Kelly have over you personally? Also, what authority does Clarence Kelly have in Christ's Church? In a state of sedevacantism, bishops are necessary to continue the Apostolic Succession. He has no direct authority over me, as in days when we had a real pope. Introibo - Have you done an article on Apostolic Succession? Not yet. On my list. Introibo you are inviting the wrath of God down upon you for attacking God's Chosen Benedictines. Good post for sure. Do you plan to do a post exposing their claims of being Benedictine Monks? Thanks my friend! Please see my post of 12/12/16 "The Strange Ideas Of Father Leonard Feeney" for my exposé of Fred and Bob's other misrepresentations. Thank you for your articles, Introibo. I've long enjoyed them, but this is my first comment. I have two questions regarding Bishops Kelly and Santay and the SSPV. I myself am a recent convert to Catholicism, and member of an SSPV church - also, I would describe myself as sedevacantist. First: what do you make of the SSPV's position on sedevacantism? As a sedevacantist myself who loves the SSPV, our priests, and our bishops, I am only ever extremely frustrated to hear the tortured confusion on this subject that comes from some of our priests, including the truly great and sincerely appreciated Father Jenkins. Their position is always "we can't know," "we don't have the authority," "it's possible he's not a pope," etc. I sometimes fear that there might be a spirit of schism given the fact that some within the SSPV think that Francis and his predecessors could be the pope, but that we can still ignore them (as we should if they are not popes). I would love to hear your thoughts on this; hopefully you can enlighten my intellect here! Second: when you say Bishop Kelly has no direct authority over you (or me) personally as would a bishop with ordinary jurisdiction, what exactly do you mean? What are some examples of where this statement applies? Might it have anything to do with the SSPV's rules about attending Mass with Thuc bishops and priests? Again, I appreciate anything you can tell me. Thank you, and God bless you! Thank you for your kind words. Congratulations on your conversion to the One True Faith! As to your first question: I love the SSPV, but in a time with no pope, we have to be extra vigilant. No cleric is above examination and criticism. We must never go back to the 1950s mentality of "a cleric can do no wrong." That's how Vatican II was able to take hold. We must keep clergy accountable. That having been said, the position of de facto sedevacantism, while saying "It's just an opinion" de jure, is disingenuous. We must first realize that a theological opinion is not a matter of taste or preference. That's all the Society of St. Peter (FSSP) has going for it. They prefer the Traditional Mass (even though most are invalid priests), and you prefer the Novus Bogus. But it's all good because they are under antipope Francis and the Vatican II sect. When a doctor gives a medical opinion, it doesn't mean he has a preference for you to have one particular ailment over another. Given the facts of the case, he believes it to be highly more probable than not that you suffer from some particular condition--and you should act upon it. Likewise, given the facts of the case, it is morally certain that John XXII through Francis are NOT popes. There is no official decision until the Church is restored, but you act upon it (which is what they do). The local abortionist has not been legally convicted of murder (under present US law) but that doesn't mean we aren't correct as calling him a murderer and treating him as one. The SSPV broke off from the SSPX. There adherents were a mix of sedes and "recognize and resisters" (R&R). So as not to lose half their congregation, they adopted the "it's only an opinion" shtick on sedevacantism, and they continue to retain it. I know both bishops and all priests (except perhaps Fr. Greenwell) are openly sedevacantist. As to your second query: Ordinary jurisdiction, in simple terms, is ruling authority attached to an office. The pope has universal and immediate jurisdiction over the entire Church bestowed directly by Christ upon his valid election and acceptance. Bishops of a diocese (and certain other prelates) are appointed by the pope and have that same jurisdiction for those under their care. The jurisdiction is bestowed through the pope and they rule by Divine Right (unless removed by the pope, who alone can take their jurisdiction away). A bishop pre-Vatican II could: issue annulments,excommunicate those over whom he has charge, suspend a priest and take away his ability to hear confessions, decide whether or not some alleged apparition is worthy of belief, grant an Imprimatur, etc. Bishops Kelly and Santay (as well as all other Traditionalist Bishops) have no such jurisdiction in the absence of a pope. They operate on supplied jurisdiction in a time of near universal Apostasy. It enables them to do what is strictly necessary to keep the Church going with a valid hierarchy. Bp. Kelly cannot excommunicate someone, grant an Imprimatur, etc, as I listed above. The rule about the Thuc line is just plain silly. Almost no one doubts the validity of the Thuc line clergy except for them. I hope this helped my friend! Thank you, Introibo. That does help to clarify things a bit. I often read about these things online, and so far in my experience you are the only blogger I've found who is both firmly sedevacantist and (I understand) primarily affiliated with the SSPV. Most other sedevacantists like NOW, Droleskey, and Laura Wood (bless them all) are CMRI (I think?) while anyone at my SSPV church seems to be bewildered by sedevacantism or unwilling to "judge" the matter. And I agree that "disingenuous" seems to be the right word for the SSPV position. But I do trust our bishops and priests and am glad to hear it from you that you regard them to be overwhelmingly sedevacantist, at least according to the principle even if their precise understanding of what that means may vary. I do understand better now, given your examples regarding jurisdiction. Thank you. I agree with you, too, about the Thuc line. From my limited perspective being new to this it does seem that Bishop Kelly took what he thought was the surest route on this issue, having seemingly genuine doubts about the Thuc line during a troubled period where much seemed to be in flux. As long as I can trust that Bishop Kelly is a true bishop and that he holds the true Faith (check mark on both counts), I will abide by his rule, knowing as you say that it is a bit silly, and praying for the day when all this can be cleared up by a true and legitimate pontiff. I always say we will need not a Pius XIII but a Pius X II ("Pius the Tenth the Second) to clean up the mess we're in. May that day come soon! I appreciate it, and again God bless you. A second Pope St Pius X is someone we certainly need! My hope is Bishop Santay will acknowledge the Thuc line's validity in the future. Personally I think we need a new Pope Urban II. A Crusade against the infidels everywhere? Not a bad idea! Looks like the Dimonds just put out an article on this subject. MHFM: This is a new post. In an attempt to prove the false title of ‘Co-Redemptrix’, which is not consistent with the Church’s solemn dogmatic teaching that Jesus Christ alone (solus) redeemed us and that He alone (solus) is our Redeemer, people sometimes cite an English translation of Iucunda Semper of Pope Leo XIII. But the translation they cite is faulty, as this post shows. The contents of this post have also been added to our main article on this matter. Thanks for the info. I read the article you referenced and it doesn't even begin to address the arguments put forth by theologian Carol. If the Dimonds don't think the title is appropriate (like theologian Pohle) so be it. They just make themselves sound that much more ludicrous by calling the title "heresy," and acting like good little Feeneyites, THEY interpret Church teaching to their own designs. Yes they are deliberately divisive. It's always funny to watch them pretend to be language interpreters, especially Greek. Bobby often pretends to be a Greek language instructor in his videos. His followers admire him and think he speaks Greek and Latin but he doesn't. He learns a few words from Rosetta Stone and then makes instructional videos. They are two idiots. When people such as the Dimonds start labeling everyone "heretics" it sets off red flags for me. The saying "what you say, you are", seems appropriate to "label" them!